Thread: 2019 SS SE (Ultra White) - X2 Shock Settings ... HELP! Hi - brand new member here ... first post! 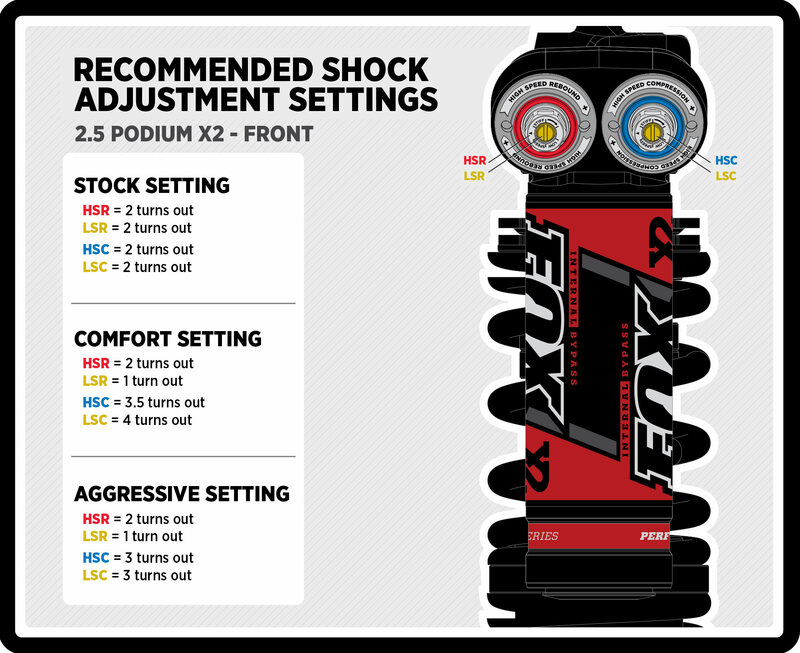 I'm picking up a 2019 SS SE (Ultra White) with the Fox X2 shocks and looking for some 'settings' advise. I live in Appleton, WI so will mainly be riding trails - also any 'layman's' explanation of what all the settings do would be a HUGE help ... Thanks in advance! You are going to get a lot of different answers. Dune riding. Slow rock climbing. Fast fire roads. Weight - some carry spare tires, etc. Some are running bigger and heavier tires. I wrote my current settings down with stock tires and 2 people. And I will bring those home with me next weekend. Setting your sag and cross-over distance is step one. The car should sag about 25-30% of the travel fully loaded. But I would drive the car a bit, get the springs settled and suspension worn in. I run slower and wanted more compliant than stock. I have backed everyting off a bunch and disconnected sway bars. It is more flexible, has more body roll but is very compliant on trails. If you flat track around and drift corners you might not like the sway bars disconnected. It is certainly worth some experimenting. Basically settings for low or high shaft speeds. Lot of variables so there really is no 1 size fits all. The comfort setting was a good starting point for my '19 in alabama trails. I pulled most of my HSC out and a little looser on LSC. Still feels like it could use a little more LSR front and rear. Set a baseline, run the same trail, and try to make 1 change at a time and rerun. Document all your changes as it is real easy to forget or get backwards on adjustments as there are so many. Last edited by dgarris; 03-18-2019 at 03:28 PM. Hub67 and Relhok like this. Your right, it's for the 17 and 18 SE and won't work for you. The 19's softened up the spring rates so only take advise from someone with another 19 or you'll be all screwed up. I have a 19 SS SE. Here's what I am running, I have only had one serious trip and I tuned the whole trip and I am running dunes so it will be different. I would suggest you start tuning asap and you will figure out what works for your terrain. 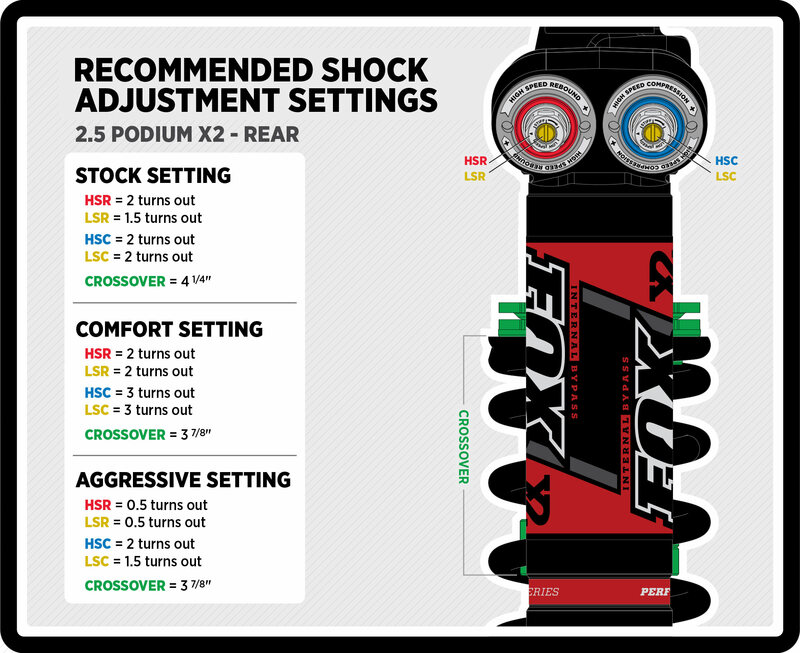 Start off soft, set your preload where you want it for your ride height, set as low as possible ride height, Write down your existing settings and start tuning, making notes on each adjustment. Good luck! 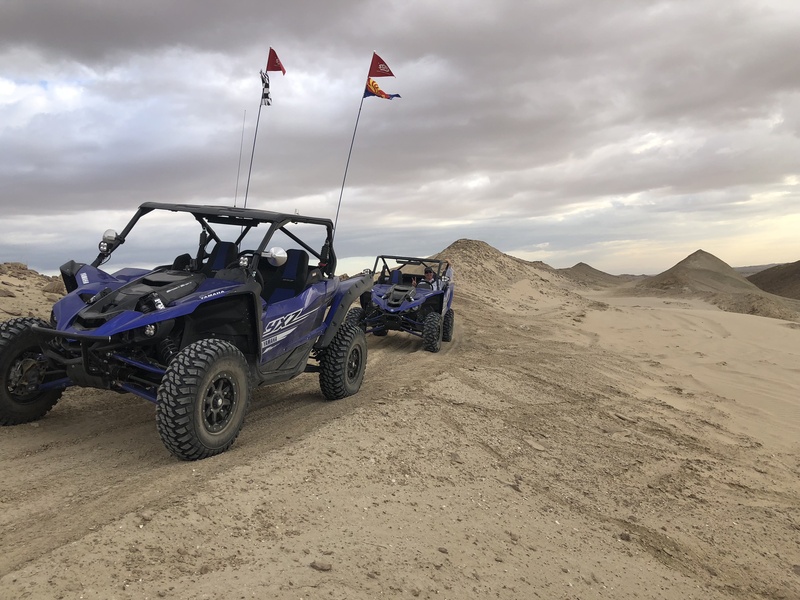 2019 YXZ SS SE, 2007 Redline Revolt with Yamaha Nitro Motor, KTM300XC, Specialized Kenevo, those are my toys. You are correct - I thought they changed the spring rates (softer) on the 2019. I've reached out to Fox for some suggestions as well. Can't wait to do some tuning! Video: 2017 SS SE (X2) in "aggressive" settings - any thoughts/recommendations?